Lee, Kim and Ahn are among the signers of the statement, released by the group WomanCrossDMZ, which was founded by Ahn. Lee is professor of Asian languages and cultures at UCLA and author of The Making of Minjung: Democracy and the Politics of Representation in South Korea. Kim is associate professor of Korean history at Rutgers University. 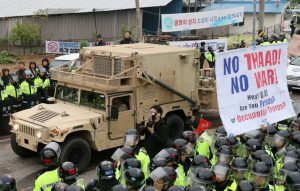 Shorrock recently wrote the piece “In South Korea, War Hysteria Is Seen as an American Problem: The big issue here is the May 9 presidential election, which is expected to bring a progressive to power” for The Nation.